A sensitive ELISA assay for exosome quantitation based on the presence of CD63, a general exosome marker. Compatible with most biofluids. When you would like to use an ELISA-based method to find out how many exosomes you have and time is not limiting, choose one of SBI’s ExoELISA Complete Kits. 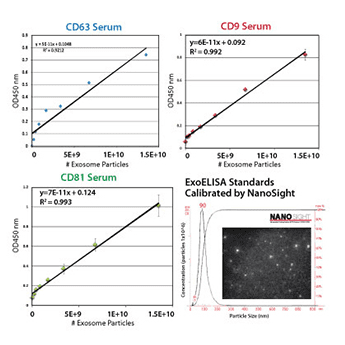 Calibrated using NanoSight Analysis, the ExoELISA Complete Kit (CD63 Detection) enables calculation of exosome abundance based on the presence of CD63, a general exosome marker. Note that our newer ExoELISA-ULTRA Complete Kit (CD63 Detection) can provide faster exosome quantitation using significantly less sample. Our ExoELISA Kits have all the reagents you need to run the ELISA—just add lysed exosome particles. The kits are compatible with exosomes isolated using most methods, including ExoQuick®, ExoQuick-TC®, or ultracentrifugation. The lysed exosome particles (and, thus, exosomal proteins) are directly immobilized onto the wells of the microtiter plate, and after binding, a blocking agent is added to prevent non-specific binding of the primary detection antibody, anti-CD63. Following addition of anti-CD63, a secondary antibody (goat anti-rabbit) linked to horseradish peroxidase (HRP) is also added to amplify the signal and increase assay sensitivity. The amount of CD63 is measured via activity of the bound HRP-secondary antibody using a colorimetric assay with extra-sensitive TMB as the substrate. The accumulation of colored product is proportional to the amount of CD63 present in each well, and is measured using a microtiter plate reader at 450 nm absorbance. Each ExoELISA Kit includes a set of standards calibrated to a known amount of exosome particles as determined by NanoSight analysis. These standards can be used to generate a calibration curve enabling quantitation of exosomes carrying CD63 from the ExoELISA data.